Thursday night was the Riesling Fellowship dinner at Vintner’s Hall. It quite grand – gentlemen were required to wear jackets and ties. [Aside: whenever I attend a wine trade event in a suit it is amazing the number of people who come up and complement me, as well as expressing surprise that I should be dressed smartly. I suspect they find it impossible to believe I am capable of appearing in a presentable manner. Or perhaps it is because my usual standard of dress is just so poor.] A small tasting was followed by dinner, but in between there was a seminar titled ‘My Life in Riesling’, during which four Riesling notables gave a short speech about how they came to love Riesling and presented a favourite wine. Jancis began by sharing how her first Riesling experience wasn’t actually Riesling. 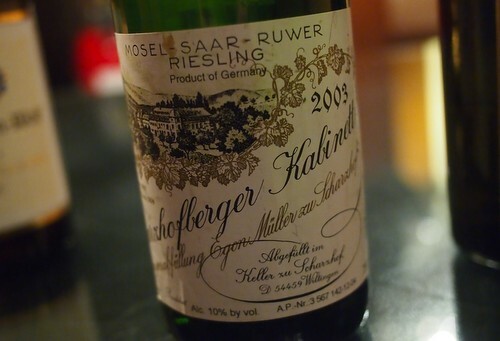 It was a Lutomer Riesling that her grandmother shared with her when Jancis was a young teenager, over lunch in Somerset. Later, at Oxford University, she made friends with a girl whose father was a Devon doctor with a wine cellar. This was the late 1960s and Jancis would go with her friend to GT Jones and her pal would point out that green bottle was Mosel and brown bottle was Hock. Her first proper experience of Riesling was via a boyfriend whose father was a German professor of law with a holiday house at Interlaken in Switzerland. While everyone else drank beer, he would withdraw a nice bottle of German Riesling from a wooden chest. 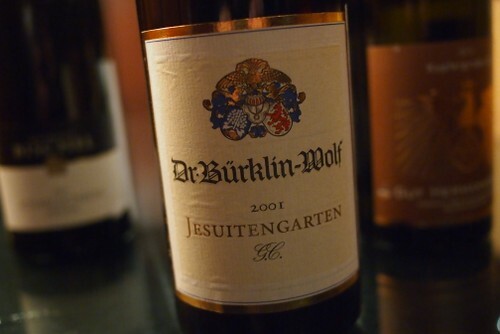 ‘This first drew to my attention that German Riesling was great,’ shared Jancis. She’s very happy that German Riesling is now so varied. David first got his taste for alcohol aged 8 at an Aunt’s wedding, back in 1967. But his wine awakening was German. His mother hailed from Germany, so they holidayed there as a family. Aged 14, in Baden, he was allowed to taste the wine, and it dawned on him that a wine from one part of the hill tasted different from a wine from another. Fast forward to the 1980s and David began to have some success as a record producer. He started buying wine from Lay & Wheeler: JJ Prum Rieslings often found their way into mixed cases. David’s career progressed and he began writing music. This generated some spare cash, and he decided to use it to try to buy an income. So he bought the local wine shop (The Winery). Within a year he realized it was impossible to survive by buying wine from the UK (with the agent’s margin, there wasn’t enough left for him) and so switched to direct importing. The customers stayed with him on this journey, fortunately. David says that he ‘was haunted by Riesling,’ and wanted to sell German Riesling through the shop. He went on a buying trip, and bought 75% sweet Riesling, 25% dry, with a view to using the dry wines to act as a bridge helping customers to graduate to sweet Riesling. But he found that the dry wines sold and the sweet wines didn’t. ‘Ever since then we’ve just been doing the dry ones,’ he reveals. ‘Our message is that German Riesling is dry. There’s a new generation who have no history with German wine, and a dwindling generation of Brits who hold prejudices from the 1960s and 1970s, but they can be swung too. We are pushing at an open door now.’ The range at The Winery is 100% direct import, and it’s one-third German. Of that, 75% is dry Riesling, 24% is Spatburgunder, and 1% is sweet Riesling. 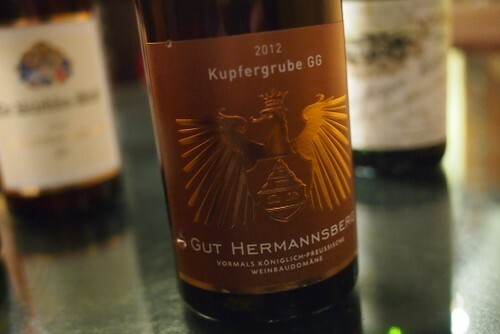 He imports German wines from 47 growers, from seven regions. Would love to see Hugh talk about wine in person. Sigh. 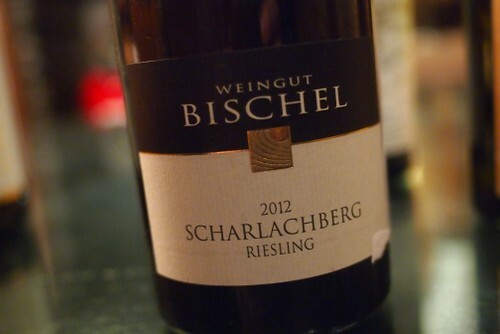 One of my favourite varieties , from anyplace in the world , though I do have a soft spot for German Rieslings. In my neck of the woods it wasn’t me who deserted German Rieslings, if was the markert that deserted me. It’s getting better over here but the selection is slim and many are expensive . Yes I love the Riesling from all around the world. But the German ones are the best. For me.